The artist thanked her fans, her family, her husband and her children. Pink received a coveted Hollywood Walk of Fame star on Tuesday. "It was out of anyone’s control," she wrote. She gave her a hug and told her it was all going to be OK. 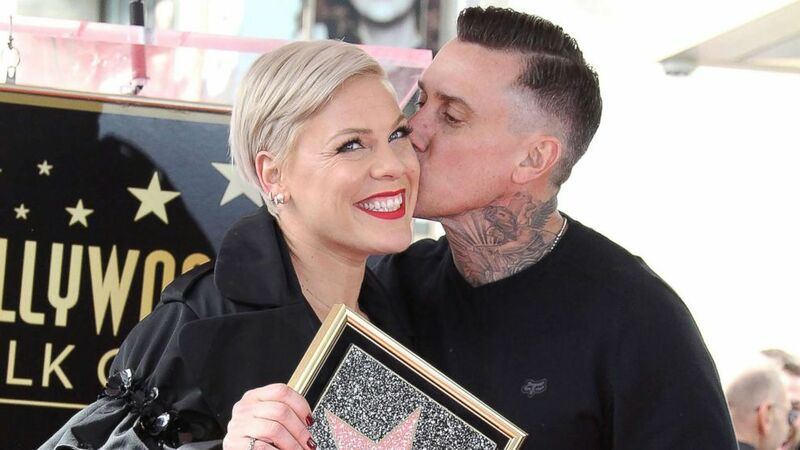 Pink and her husband, Carey Hart, dressed up as a the iconic TV duo. The 39-year-old Grammy-award winning singer accepted the honor with an earnest reflection on the power of hard work and embracing one's own individuality -- along with a dose of her signature humor. Along with thanking her supporters, the singer also acknowledged the many people that doubted her success. "I feel like a lot of people probably only ever thought I would make it to the walk of shame, but here I am," she said. "It has been a trip, lately, thinking back over the course of this career that I have somehow managed to have,” she added. (Frederic J. Brown/AFP/Getty Images) Pink poses with her husband Carey and two children on her Hollywood Walk of Fame Star at a ceremony in Hollywood, Calif.
“I thought I could have a hit record but I never thought in my wildest dreams that I could have two decades of this insane fun with a family of people I love,” she said. The artist also talked about the importance of remaining true to yourself in the profession. "Today, for me, is a celebration of something that my dad taught me, and that is: to thine own self be true," she said. “If you walk along this boulevard and you look at these names, there is a power in that." There is a power in believing in yourself. There is a power in not giving up on life and on not giving up on yourself. “There is a power in believing in yourself," she continued. "There is a power in not giving up on life and on not giving up on yourself." "And there’s a power in making a decision that, while you may not be the best that ever did it, you may not be the prettiest, or the tallest or the funniest or the most talented -- or whatever it is, you tell yourself you’re not. If you’re stubborn and you don’t give up and you work really hard, no one else can ever be you," she said. (Broadimage/EPA via Shutterstock) Pink is honored with a star on the Hollywood Walk of Fame in Los Angeles, Feb. 05, 2019. The singer also turned from the speaker's podium to directly address her husband with a sweet message during her speech. “My husband," she said. "He’s so cute, he’s my muse and if he didn’t piss me off all the time, I’d have not much to say, thank you. I literally wouldn’t be standing up here if it weren’t for you, so never change." Along with thanking the guests who spoke in her honor, including Ellen DeGeneres and Kerri Kenney-Silver, Pink mentioned her children. "My children, Willow Sage and Jameson Moon, you guys are my stars, and I would never shine without you."